FLOOD EDITION Makes the News! 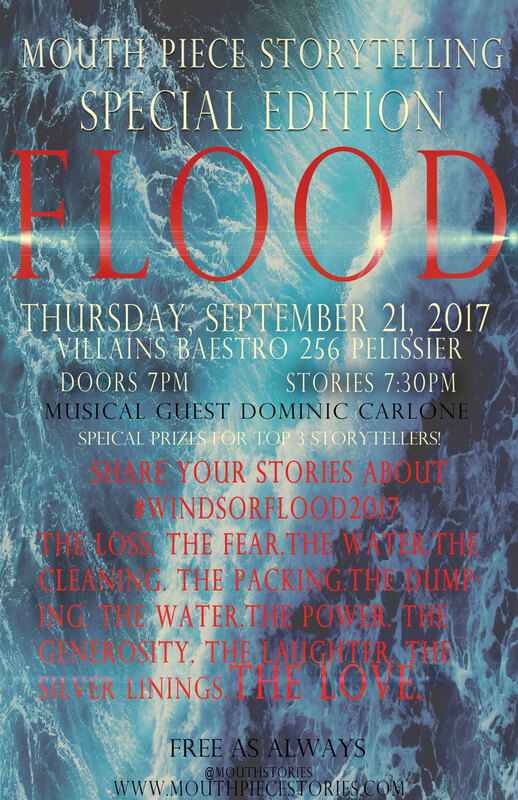 Our SPECIAL ‘FLOOD’ EDITION event made CBC Windsor News – both radio and on-line!! Journalist Chris Ensing came to the event and videotaped it – the put together this great story! CLICK HERE TO SEE VIDEOS OF OUR EVENT! Thank you Chris and CBC Windsor for coming out to share our storytelling event! Thank you to the local businesses that donated some fantastic prizes: Windsor Vacuum, DeZenio Hair Salon, Suede Productions and Cypher Systems Group. Congratulations to our THREE MASTER MOUTHPIECES – Storytellers Geoff, Alicia and Peter! Photos forthcoming! ALERT! THEME CHANGE FOR NEXT EVENT! SPECIAL EDITION! THERE HAS BEEN A THEME CHANGE FOR OUR NEXT EVENT! FLOOD us with your flood stories. WE WILL HAVE SPECIAL ‘FLOOD’ PRIZES TO GIVE AWAY! Here is our Facebook event page – let us know you’re coming! We will resume our CHILDHOOD edition in November – featuring Guest Storyteller Janice Smith! The Childhood Edition – Thursday, Sept. 21! Our next Mouth Piece Storytelling event will take place at Villains Baestro (256 Pelissier) on Thursday, September 21, 2017. We will feature guest storyteller Janice Smith, a laughter yoga instructor with a mouth not just for laughing but for sharing incredible stories! On guitar, Dominic Carlone, a major staple of Windsor’s music scene, will bring us original and cover tunes. So childhood…we don’t know about you, but come September when the scent of Crayola and new running shoes is in the air, we get crazy nostalgic. Do you feel an aching need to buy a new lunch bag? Me too! What are your childhood stories? Is there a back-to-school moment you just can’t forget? How about a bad haircut or an outfit you just can’t forget? Maybe you built a fort or took a trip that is forever in your storytelling repertoire? Whatever it is that you’ve lived through in childhood – we know there are countless stories you can unload on us! We hope to see you there! Bring your memories wrapped in a childhood story! We are all ears! We’re @mouthstories on Twitter – so tweet away! Our next storytelling event will be held at Villains Baestro on Thursday, September 21, 2017. Featuring Guest Storyteller Janice Smith. Guest Musician – TBA! Mark you calendars..and start sweeping your mind for stories about CHILDHOOD! Summer Hiatus! We’ll return in September! Mouth Piece Storytelling will be taking the summer off – to live, to love, to create new stories! We will be back to the stage in early September! ‘Till then – thank you and keep sharing your stories! 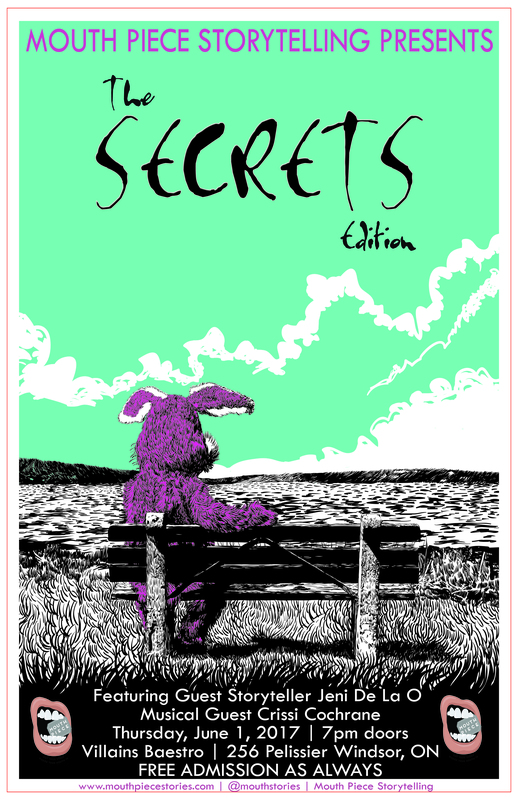 She is the Master Mouth Piece of our Secrets Edition! Congratulations and thank you to all our storytellers! Boy, it’s no secret we had loads of fun! More photos and fun stuff to follow! 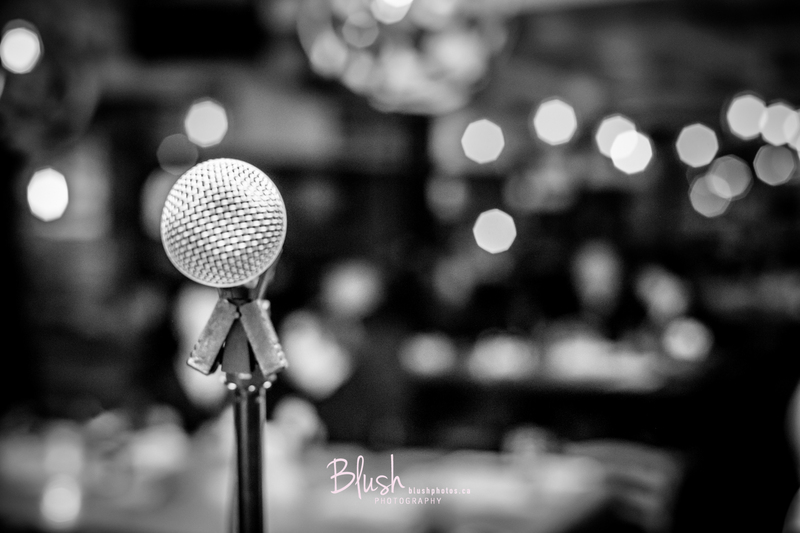 Mouth Piece Storytelling – Two Events in Five Days! Sheesh, Windsor is a grand city! Over the next five days, we’ll be having not one but TWO storytelling events! Here is the first one: Shout Out! 150! 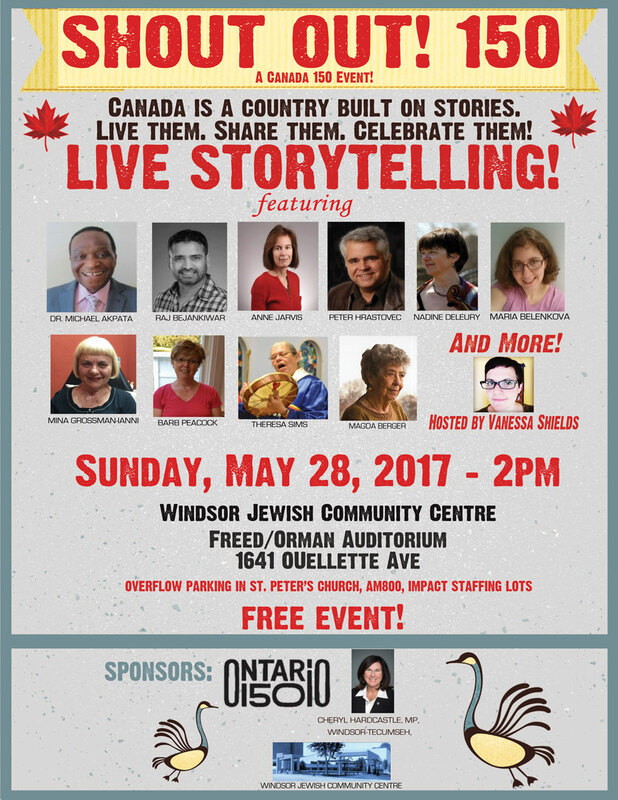 A celebration of Stories about Canada! I’ll be hosting this unique event that will showcase a diverse cross-section of storytellers from our community! 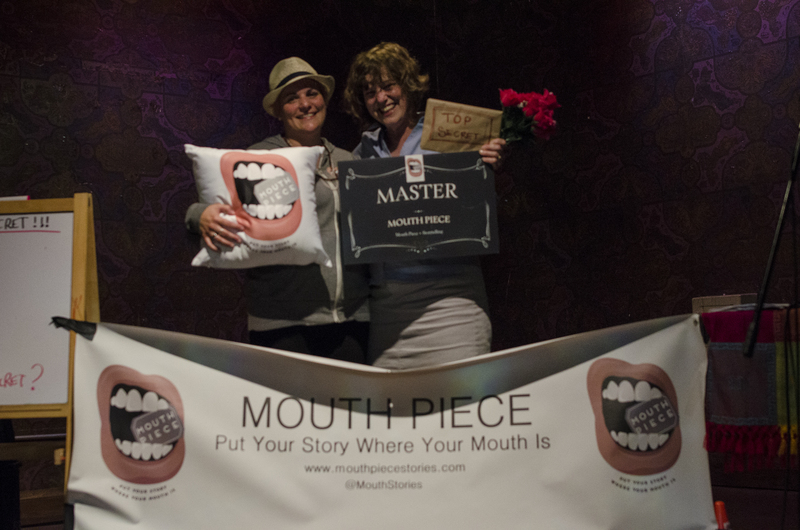 Our next Mouth Piece event is on Thursday, June 1 – The Secrets Edition! 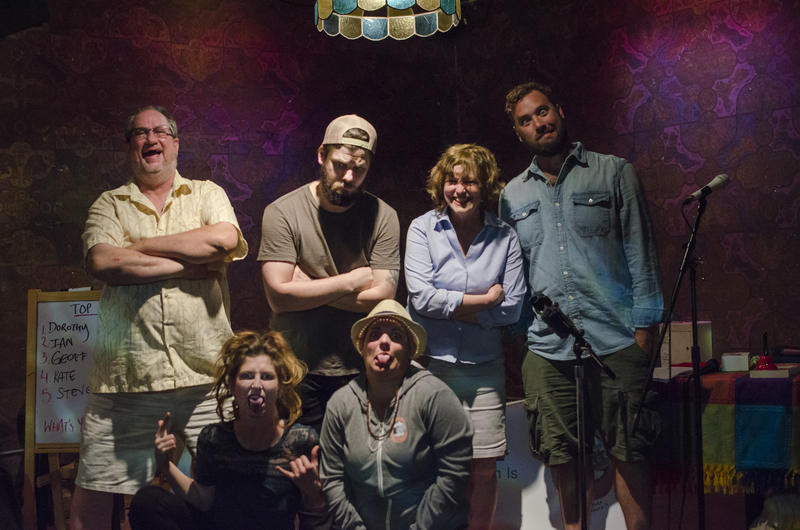 Featuring Guest Storyteller Jennifer De la O and Guest Musician Crissi Cochrane! Both of these events are free! Here are the Facebook links – let us know you’re coming! Put Your Story Where Your Mouth Is!